op tion and the fact there is are only 2 other Thai restaurant in the area (which are Crystal Elephant and it barely qualifies as a Thai restaurant! There is also Sandar's). Before I even knew it was open, I got an email from a reader suggesting I give it a try. Well, I didn't need much convincing! Since the place has been only open for about 3 weeks, the parking lot was empty like it was before. Let's hope it doesn't stay empty for long. Apparently, the place is run by Manop, who was a long-standing chef (over 20 years) of the Thai House Group. This was quite evident in the food except with a few subtle differences. When I decided to order 2 meals for lunch, the nice fellow there was a bit taken aback. Well, I need to sample more than one item right? 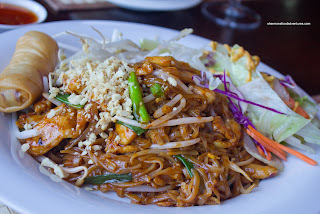 I started with the Spicy Pad Thai which was served with the daily soup, one spring roll and green salad. Much like the Thai House, the pad thai here was saucy. Now, before people get up in arms about this, I really didn't mind it since I was not expecting anything less. Furthermore, there was a decent amount of spice and the rest of the components were cooked properly. I wasn't a huge fan of the spring roll though. It was really dry on the inside which made the entire roll a bit tough to eat. However, on a subsequent visit, it was perfect, so I guess it was a one-off. 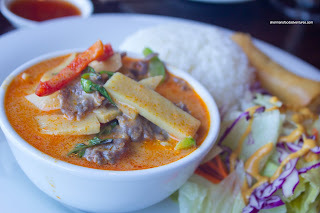 For my second dish, I had the Beef Red Curry. There was plenty of crunchy bamboo shoots and peppers intermingled with basil and tender beef within the balanced curry. There was a mild spiciness to the otherwise smooth tasting sauce. As mentioned, I made another visit within a week to try out at least one more item to get a feel of the place. The friendly server suggested I try the Basil Chicken prepared Thai style, which meant a nicely fried egg graced the mound of rice. Interestingly, such a simple addition made this so much more enjoyable to eat. I guess it adds a little something something to an otherwise pretty common Thai combo. 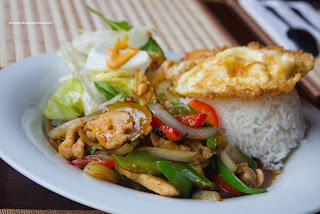 As for the basil chicken stir-fry itself, the veggies were vibrant and crisp while the chicken was moist and caramelized. The dish was mild with only subtle hints on heat. 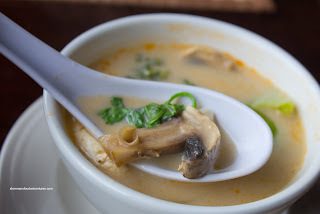 As with my other visit, the meal included soup which was a veggie Tom Yum this time around. 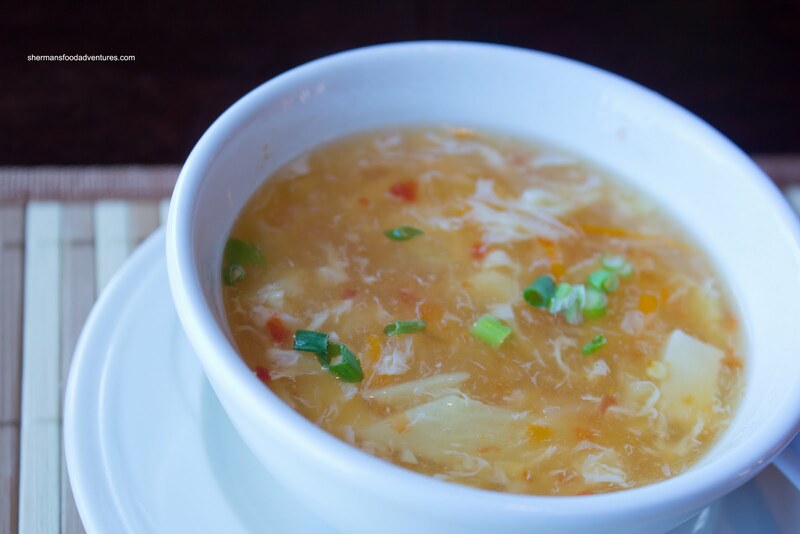 Wow, this was really flavourful with huge hits of lemongrass and fish sauce. It was very fragrant and a touch spicy. I just wanted to keep drinking it. In fact, I don't really care if there is nothing to blog about if I do any subsequent return visits. 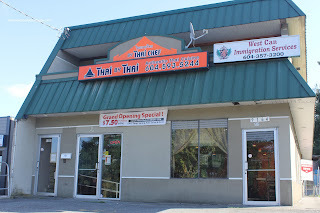 This is the best Thai restaurant in the North Delta area. 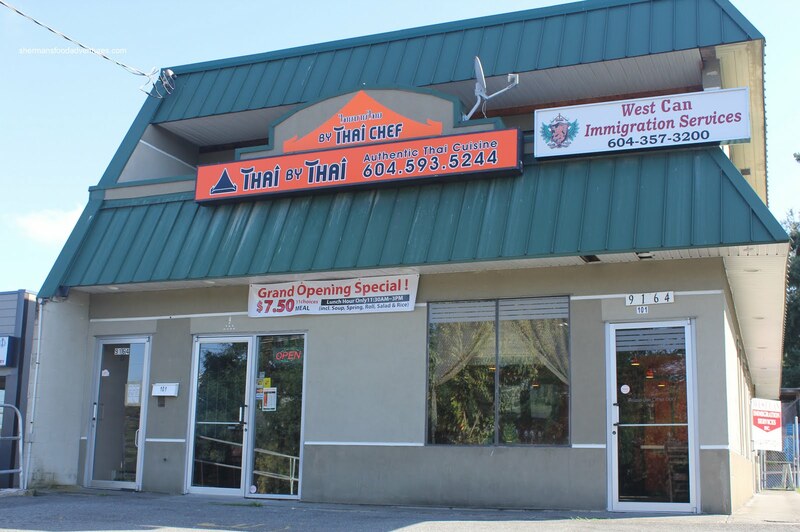 Mind you, the closest competition nearby doesn't even come close... Sure, to some, the food does bear a striking resemblance to the Thai House with a few tweaks (after all, the chef did work there for over 20 years). However, you can request for more authentic preparations (and the spice level) of every dish. And besides, they must cater to the local tastes to stay in business. I went here on the 21st because of your post. We were very impressed. Panang curry, pad Thai and ginger beef, all delicious with great flavours.